Posh manager Steve Evans at Oxford. Photo: Joe Dent/theposh.com. Peterborough United manager Steve Evans accepted his share of the blame for a disappointing 2-1 League One defeat at Oxford United today (March 17). On a nightmare afternoon in awful conditions, Evans suffered his first defeat as Posh boss, saw his side slip out of the play-off places, saw skipper Jack Baldwin sent off and lost key midfielder Chris Forrester to a nasty leg injury just minutes after he’d arrived on the pitch as a half-time substitute. Posh striker Jack Marriott in action at Oxford. Photo: Joe Dent/theposh.com. But it was his own team selection that started the rot. Jermaine Anderson started a match for the first time since December 23 as an advanced midfielder in a 4-4-1-1 formation, but he was substituted after just 38 minutes to accommodate a second striker. Posh fell behind early in the game and conceded a second goal just before the hour mark. 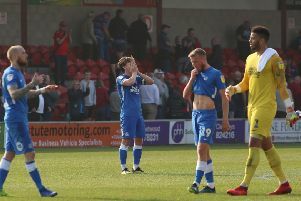 Top scorer Jack Marriott immediately pulled a goal back, but Posh rarely looked like finding the equaliser that would have kept them in the top six. “A lot went wrong for us today,” Evans admitted. “I got the team selection wrong, the shape wrong and the system wrong. We also didn’t work hard enough as a team in the first-half. “I had to take someone off to get a second striker on and, although Jermaine didn’t play well, he was far from the only one. He was no worse than six or seven others. Posh misfielder Chris Forrester limps out of the game against Oxford after getting a nasty cut just above his knee. Photo: Joe Dent/theposh.com. “The conditions helped them score the first goal, but Oxford were better than us. We did create a couple of good chances to equalise, but we couldn’t take them. “The conditions were farcical. Both sides spent a lot of time hemmed in by a strong wind, but we are capable of better. “My young group of players will learn from this defeat and so will I. We have had a hard week with two away games, but we will get a good week in on the training ground and get a plan ready for the next game. Evans was unhappy with the challenge that left Chris Forrester injured. He also felt Baldwin was unlucky to be sent off as ‘the second caution was just a foul’. Evans also believed referee Rob Lewis should have added more than seven minutes added time for the home side’s time-wasting. Posh are next in action at home to Bristol Rovers next Saturday (March 24).